Long Tail Pro carries displays information on searches for keywords related to the terms you enter. With the information returned it’s easier to pick out keywords you have a chance of ranking for. 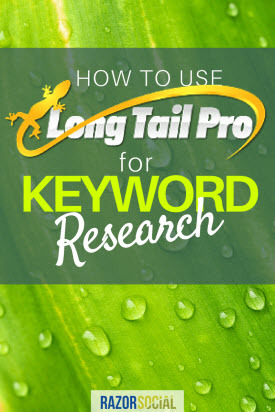 There are a range of keyword research tools available, but one of the biggest benefits of Long Tail Pro is the ability to search for many different keywords at once. No need to search for every option individually! Just plug in your ‘seed’ keywords all at once and set it to work. To get started with Long Tail Pro, download the software from the Long Tail Pro website and install it onto your computer. Click ‘Find Keywords’ on the top left. 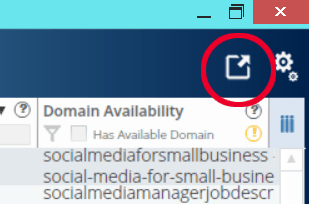 Click in the box underneath ‘Add seed keywords’ and input a word or phrase related to your industry or niche. Click ‘Add’. Repeat this as many times as you want to, including as many relevant keywords as you want. Next, you want to add filters to make sure you only see results that are worth your time. 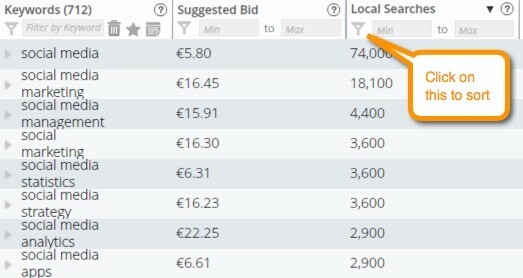 Here, you can choose to only see longtail keywords that have a certain search volume (either locally or globally), you can choose how long the keyword phrase should be, and you can select which top-level domains should be included, if you want to find an appropriate URL to buy. When all that is done, click ‘Generate keywords and fetch data’. It can take Long Tail Pro a few minutes to provide the information you need, depending on how many keywords you are searching for and how many filters you have put in place. Wait patiently for the magic to happen! The Long Tail Pro team made a video to show this process, step by step. Depending on the popularity of your keywords and the filters you have set, you might find that you are faced with hundreds of results. Long Tail Pro makes it easy to manage these results and make them useful. You will see that there is a column for each of the filters you set when you started the search. You can order the results using the columns. So, if you want to see the results with the longest phrases first, click on ‘Number of Words’. This will display the results with the shortest phrases first – just click again, and you will see the longest phrases at the top of the results. You could also choose to see the results in order of search volume, or competition. You can also filter by keyword. For instance, you might only want to see results that contain the word ‘strategy’. You do this by typing the word into ‘Filter by keyword’ in the Keywords column. When you find the long tail keywords you like you can then view the Google search results for these keywords. Domain authority – This is overall authority of the website. Juice links – The number of authority links, not all links are useful. Moz rank – A ranking of a website provided by a company called ‘Moz’ . More authoritative sites have a higher rating. Age of site – Older sites tend to rank better so you’ll see the older sites get a higher number. What you are ideally looking for is listings in search results that don’t have many juice links and their authority is quite low. 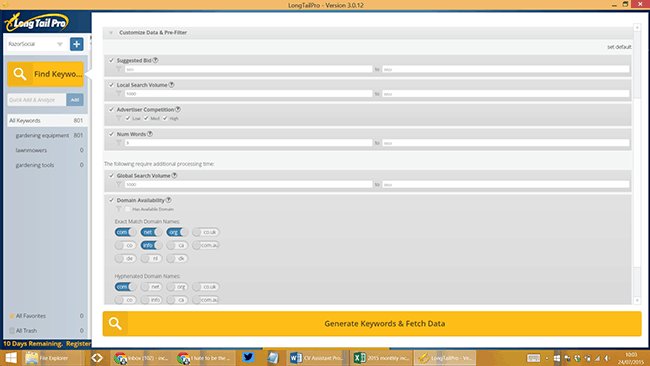 With the premium version of Longtail Pro the keyword competitiveness score is also completed. This takes into account the domain authority, page authority, links etc and then calculates a score. The ones with the lower scores are easier to beat in search results. The first result has a reasonably low domain authority but a high page authority. If you look at the ‘juice links’ column you see there are a lot of good quality links. It’s going to be hard take over number 1 position for this! The third result doesn’t have ‘social media search‘ as a direct match in the the meta title displayed but you can see that it has over 30k juice links so good luck trying to replace that one! The 7th result has a low domain authority and no juice links so there’s a good chance of beating that in search results. Do you know where your website ranks on Google, Yahoo! and Bing for your target keywords? Long Tail Pro has an added feature where you can input your website address and keywords, and it will carry out a search to track where your site ranks on each of these three search engines. If you haven’t set up your website yet and want to find a website address that includes your best keywords, Long Tail Pro can help. Warning: If I were you I’d avoid this functionality. Years ago Google used to rank websites better for keywords that were in your domain name. Every year Google places less emphasis on this so I think you should ignore this and not use this functionality! While being able to filter and look at your data within the Long Tail Pro app is useful, many people prefer to use their own spreadsheet. To export your data to a spreadsheet, click this icon on the top right of the screen. 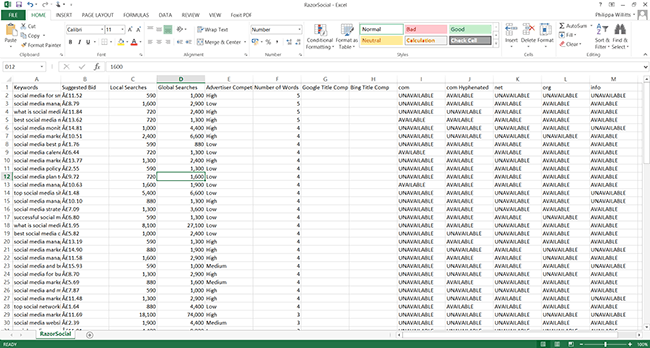 Now, you can manage large amounts of data within Excel. It costs $97 to buy, or you can choose the Platinum option which is $97 plus $27 a month. There’s a free 10 day trial worth trying out. Do you like the look of this tool? Which Long Tail Pro feature would you use the most?